Sammy’s mother, Beth, already coping with the overwhelming responsibility of raising three sons alone, watched helplessly as her middle child descended into madness. Sammy was soon diagnosed with obsessive-compulsive disorder (OCD) and later with Tourette syndrome. Unwilling to accept the doctors’ prognoses for lifelong mental illness and repeated hospitalizations, Beth fought to uncover what was causing this decline. Racing against time as Sammy slipped further from reality, Beth’s quest took her to the center of the medical community’s raging debate about whether mental illness can be caused by infection. With the battle lines firmly drawn, Beth searched until she found two cutting-edge doctors who answered that question with a definitive yes. Together, they cured Sammy. Five years later, he remains symptom free. Driven by her desire to help others, Beth Maloney has infused every page of this triumphant journey with heart and passion. An important story, Saving Sammy is part manifesto, part medical mystery, but is at its heart the empowering and inspiring story of a mother’s determination to save her son, take on the medical establishment–and win. BETH ALISON MALONEY is a successful Maine attorney and guardian "ad litem." Before moving to Maine, she was an executive and attorney in the motion picture and television business in Los Angeles. "Saving Sammy" is her first book. 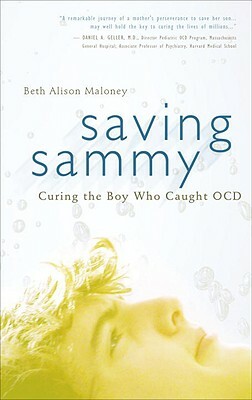 Maloney's debut chronicles her son, Sammy, and the illness that, almost overnight, transformed him from a sunny, bright boy (described by one teacher as "the purest math mind the school had ever seen") into an antisocial stranger "so dominated by obsessions, compulsions, and rules that daily life becomes impossible." Sammy's descent into mental illness was diagnosed as severe Obsessive-Compulsive Disorder, Tourette's and a number of other ailments, all promising a lifetime of disability; it wasn't until a family acquaintance, whose son exhibited the same symptoms for 10 years, urged Maloney to have Sammy tested for Strep that they learned his condition was treatable. Describing herself as "part courtroom lawyer and part detective," attorney Maloney perseveres with ferocity and sharp storytelling instincts, making this medical mystery—meant to inform families dealing with mental illness—a tear-wrenching crowd-pleaser. "SAVING SAMMY is a remarkable journey of a mother's perseverance to save her son. Her discoveries may well hold the key to curing the lives of millions of others." "Of all the children I've treated, Sammy is the one at both ends of the spectrum. I'd never seen one so sick or one who came so far. I think the difference was his mother. Her willingness to be aggressive and fight for her son may help in healing others." “With SAVING SAMMY, Beth Maloney is the first to document the harrowing journey as a mother of a son with strep-triggered OCD— known as PANDAS. This compelling story is written in such a clear and engaging manner that the reader is hard pressed to put it down. Ms. Maloney’s poignant description of both the ravages of the illness itself and the hurdles to find treatment not only sheds light on the dark corners of this disorder, but captures the universal anguish of any parent watching their child slip away and at the same time being determined to hold on with all their might. In this gripping memoir, we see living proof of the much contested connection between strep and OCD. We also experience the agony of a parent who knows that solutions are out there, but can only be accessed by overcoming the obstacles and biases within the medical community. By sharing her family's ordeal and ultimate triumph, Ms. Maloney urges us all to make a pivotal shift in how we look at mental illness and its cure. The quality of life for thousands, if not millions, of families depends on our doing so. “There isn't a parent who would not want to have this information. The implications of this riveting story reach far beyond children who are afflicted with obsessive-compulsive disorder."